Scores from the: I've ridden 302 miles in the last three days and rode the three days before that, the wind is in our face, there are huge hills, and Jim never slows down, bike tour. In the tray labeled eggs: Think of ground beef being used for sloppy Joe's, but in finer crumbles, stick some of them together, ball some up, serve cold, and use styrofoam plates and plastic utensils. Jim actually thinks they are real eggs, not because they look or taste like eggs, but because he thinks powdered eggs are more expensive. Peter thinks they look and taste like wallpaper paste, but I have no experience either using or eating wallpaper paste. My solution: consider it Gazpacho. I put ketchup in a styrofoam bowl and mix in whatever this is. Rating: Cannot be considered a food. In the tray labeled sausage: Maybe the grossest thing I have ever eaten. 100% lard, dripping, from a huge stack. Rating: Should not be rated, this should not be consumed by humans. Bagel: Think of the packages of bagels from Krogers that are totally white and pasty. Clearly the highlight of the meal. I would give it a .3 on a scale of 1-10. Served with a butter substitute. You need to appreciate that we have to eat. We are burning 1000's of calories so this must be consumed. How tough was it today: Our bike mechanic Rick who is the classic stoic is complaining. Huge hills, but the problem is the wind. It zaps you mentally and physically. The route: We do not get maps, we get directions i.e. turn left in 2.5miles onto route 45. We had 2.5 pages of directions today. I am sure we went through Marlboro and Berlin twice today and passed the Grace Bible Church twice. My guess is that we are going in circles. The only problem with this theory is that the wind was always blowing against us. 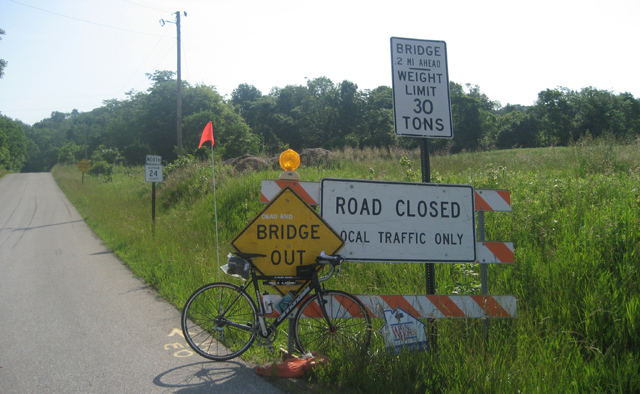 Detours on a bike trip: Cruel and unusual punishment. Added 4 miles today. Cici's pizza: When I am done riding I try to immediately find the closest place to the hotel where I can eat. Today it was Cici's pizza where they have an all you can eat from 2-4 for $2.99. The most obese people you could imagine were in this restaurant. Jim, Peter and I lead out of the hotel. There are huge hills in the first 34 miles and Peter's knee is hurting. Five miles from the hotel Peter takes the Van to the first SAG stop. Considering the ride yesterday, this first stretch is a strength sapper for me. At the SAG we catch our bike mechanic Rick and George who had an early start. George wants to ride with Jim so they take off. 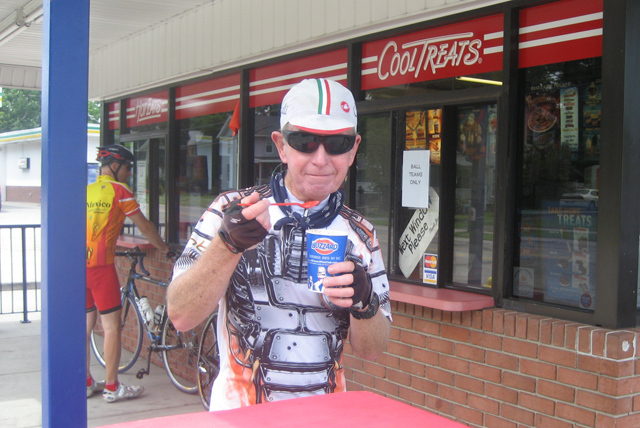 Peter rejoins me and I struggle into the second SAG where Jim and Rick are still refueling. George is also at the second SAG but he does not want to jeopardize is early starts by finishing with the leaders. I have great respect for George, who finished many hours after all of us on the ride to Dalton, but finish it he did. He is learning how to ride quickly. Good for him. Jim and Rick take off. Peter and I meet Jim at the DQ another 15 miles out. I have a BBQ beef sandwich and feel a little better. Quite a tough day for tired riders. Tomorrow: 89 miles to Erie, PA.
Not a sign a biker wants to see. Lots of neat houses today. If your trying to find this man, the DQ is the best place to start. P.S. when your done you should read some micheal pallen books on food! sure you are not in de-niles? you getting closer and closer!! soon to be in the east!! Al, I had lunch with Chuck today. He told me about this amazing journey. And to think I've been worrying about a measley 100-mile One Helluva Ride next month! What a pansy I am. At least I will be better fed before that ride. Good luck! Bath Township? I know the area and can confirm killer hills there. I'm hoping that the route you're taking to Erie is close enough to the shores of Lake Erie that it will at least be more flat. (Heck there are hardly ANY hills along the shore of Lake Michigan ...) Hang in there, that area is so deceptive - the rolling hills beyond old mountain ranges. Getting there, Al - only 8 more significant days of cycling (as if you didn't know). Impressive just how far you're pushing the omnivore envelope, could be an inspiration for dieters. Don't know how you do it - thank God.